All transactions are safe and secure with a reliable history in online purchasing behind each of our associates. Buy the Boondock Saints Smoke 'em Cross t-shirt to own Boondock Saints clothing and merchandise. The fronts of these red Boondock Saints t-shirts display a Celtic cross underneath the MacManus brothers lighting up their cigarettes. 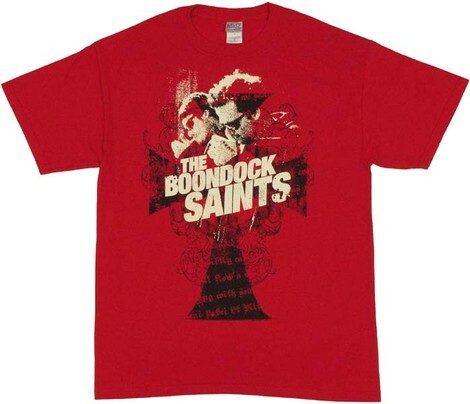 The Boondock Saints logo can be seen across the chest. Say all of your prayers in this tee, which will go perfectly with your Veritas Aequitas tattoos. Wear this Boondock Saints merchandise item to your next St. Patrick's Day celebration. Just stay clear of the Russian mob. Match it with a Rosary necklace. In addition to the Boondock Saints Smoke 'em Cross tee above, browse the Boondock Saints Clothing Gallery for more apparel like men's and women's clothes, kids shirts or hoodies.